Warning! BestEssays.com is a part of Universal Research Inc. essay writing services network, notorious for the breach of contract and selling essays that have already been sold in the past. Owned by Yuri Mizyuk that holds Universal Research Inc., BestEssays.com (Uk.BestEssays.com) is an essay writing service where students place orders for academic papers. Universal Research Inc. is the company based in Ukraine. It claims that BestEssays.com was founded in 1997, but according to the Web Archive, it was founded in 2004. EssayWriters.net is the name that people find alongside BestEssays.com. Well, this is because EssayWriters.net is actually an academic platform where writers get orders from BestEssays.com. So, technically, BestEssays.com owns EssayWriters.net. Universal Research Inc. also owns https://www.ninjaessays.com/, https://www.rushessay.com/, https://www.superiorpapers.com/ and other websites. BestEssays.com has high prices so students pay for papers from $19 to $54. Yet the quality of the papers isn't good. To make things even worse, writers are paid peanuts in the best case. I'm saying "in the best case" because writers didn't even get the money for writing services which is clearly dishonest. All this proves that BestEssays.com isn't legit and neither are other sites owned by this person. BestEssays.com and other sites have got a pretty bad reputation, due to its owner who cheats people around the world. This man is well-known for cheating and making immoral moves. So, this BestEssays.com review will help you save your money and time, whether you want to order a paper or become a writer for this company. At the EssayWriters.net website, you'll read great things about this company. Namely, the description says the company offers good working conditions to its writers. This includes competitive rewards, continuous flow of orders and live support. Unfortunately, many writers fall for what they read, not knowing they're falling into a trap. What one reads at this website is far from the truth. 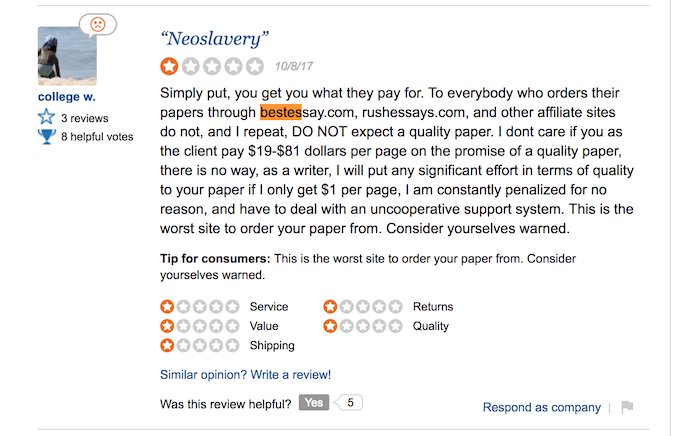 After I read reviews about this site, I realized that BestEssays.com writers are actually exploited. Not only have they worked hard they also got a ridiculous amount of money for every paper (according to the reviews, writers get between $0.01 to $4.9 per page, while students pay from $19). In addition, they don't even get their hard-earned money, because the company deactivates their account so they don't have to pay them. Unbelievable. Of course, writers have left reviews at SiteJabber and other sites in order to warn other people. Prices at BestEssays.com starts from $21.99. Compared to average market prices, it's expensive. As a student, you'll find numerous discounts and get BestEssays discount code. However, this doesn't mean much because you will probably still get a poor quality paper. And let us not forget that your writer won't get a penny from the work he/she did for you. So, taking into account the quality of the paper you receive, the prices are pretty high. As stated by SimilarWeb, more than 93% of visitors are from Kenya while only ~3% are from the USA. This means that writers who work for this company are from Kenya. So, most writers don't have good English language knowledge, thus the quality of papers is poor. Of course, there are many writers with good English writing skills, but keep in mind that they receive the lowest payment so they aren't satisfied and motivated. This explains why many writers missed the deadline, so the clients got a poor grade for the paper. Also, about 50% of reviews at SiteJabber are negative. As for the positive, some clients claimed they received good quality papers on time. Indeed, there are many positive BestEssays.com reviews that seem real. However, it doesn't mean that those reviews are honest. It's fact that many of clients was unhappy with the service. As for money back guarantee, well, there were cases when clients paid for papers, and requested for a refund, since they didn't even get a paper and no one responded. According to the site, refunds are rare, and if you happen to be unhappy with the paper, you must name clear and strong reasons. Only then the reviewing team will take a look at your refund request which still doesn't mean that you'll get your money. Everyone can request a refund within 72 hours after order completion. After 3 days, it's to be assumed that you're satisfied with the product and will not be eligible for any refunded amount. To receive free revision BestEssays.com requires that the students provide the request within 14 (30) days, depending on the type of work. Even though they claim you'll get revisions if needed, clients said writers refused to make changes in the paper and they had to do that on their own. Whether you want to work as a writer or place an order, you should know that every site owned by this company got a bad reputation, because of obvious reasons. If you want to see it for yourself, you can read BestEssays review at SiteJabber and similar sites. In fact, I suggest you do that because you will definitely have things to see. So, to sum up, the quality of papers is sometimes good and sometimes bad, and the prices are high. But, it doesn't end there. The worst part of this site is that some students had problems at the college or school. 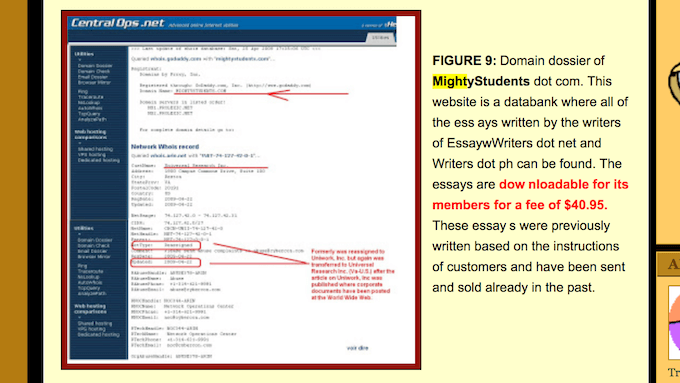 This happened when the site sold their papers through MightyStudents.com, so they were accused of plagiarism. So MightyStudents.com is a kind of a databank where all of the essays written for students can be downloaded for a fee (source). I'm as shocked as you are. BestEssays states that they have been working since 1997. It's a lie. According to WebArchive, there was no such essay service till 2004. In addition, there are also fake review sites so be careful. I did a little research and found dozens of affiliated sites that redirect traffic to Universal Research Inc. essay services. This company is a #1 in making fake review sites, so be careful. 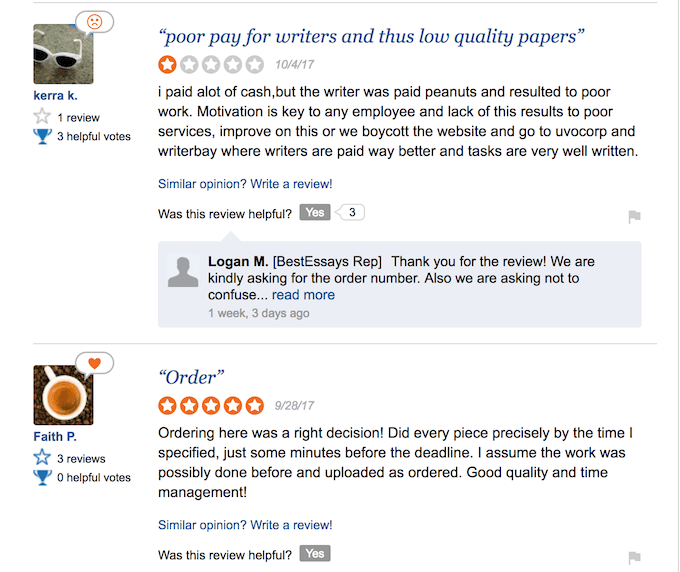 Fake review sites mean that the company creates essay writing service review websites that are obviously scam. Their purpose is to present competitors by posting bad reviews about them. What's more, the owner of these sites wants to drive traffic to his own essay services by writing positive reviews about them. While this marketing strategy may seem like a smart one, it usually doesn't take too long to reveal these fake reviews. When you compare these review platforms, the first thing you'll notice is that they all praise the same sites: BestEssays.com, NinjaEssays.com, College-Paper.org, RushMyEssay.com, etc. The next thing that tells you these are fake sites is that their competitors have got a bad rating and bad reviews. Finally, all of these praised essay services have the same order form. So, I guess the truth is you never know when you read a positive review whether it's true. Therefore, instead of focusing on positive reviews, read negative ones because you'll probably get a better picture of the site. Discounts. There are many discounts that this site offers and you can find/get codes in order to pay less than you planned to; however, the prices will still be high. Quality. While some people received a bad quality paper written in poor English, there are many of them who were satisfied with the paper. Reputation. This site, as well as those I mentioned above, got a bad reputation because the owner is well known for his illegal practices he employs though these sites. Reselling. Some students' papers were sold without their knowledge, violating the contract. Pricing. Considering the poor quality of the service the prices are high. And with all the things I just found about BestEssays.com site, it's clear that I didn't place an order. It's obvious that this company is a scam, and that the owner has done and is still doing illegal practices through his "essay writing" websites.